Portraits hand drawn from your photographs by our talented portrait artists. Portrait commissions in Pencil, Colored Pencil, Charcoal, Pastel and Oil. A portrait is a gift that lasts a life time. It can be a unique art gift for your family, friends, spouse and all your loved ones!It is also a perfect gift for a valued customer, your Board Chairman, or the person who has everything else in life except a portrait of himself/herself to cherish forever! We offer a Full Guarantee on all portrait paintings and drawings. If you do not like the artwork, we refund your deposit 100%,including portrait artists' hours. 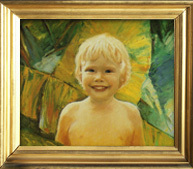 Our dedicated team of portrait artists can make beautiful portraits from your photos. We have a complete solution for you from portrait drawing to framing and shipping to your doorstep.